Our 40th Anniversary “A World of Quilts” is only a few weeks away. It’s shaping up to be a great show. We will have on display nearly 200 registered quilts; quilts by our speaker, Paula Nadelstern and our invitational quilter, Karen Eckmeier; the Sacred Threads Quilt Exhibit; our SIG’s; FANE; and our beautiful Challenge Quilts – in the neighborhood of 300 total! It should be spectacular – invite your friends and relatives to see all these great quilts. I received some good news this past week. It seems that WCSU made a mistake when looking at their 2020 calendar when they told us we could not hold the show there on our traditional weekend. After looking again at their calendar I received confirmation that we will be able to have our show at WCSU on May 2 and 3, 2020. This takes the pressure off of us scrambling to find a new venue in just a few months. However, the Board also recognizes that there is concern with the financial aspects of holding the show at WCSU and will still be looking at that. We made changes for this year’s show to increase income and decrease expenses to help with the finances. Once the accounting for this year’s show is done, we will evaluate its cost and decide if we need to make a change. Keeping our show at WCSU in 2020 gives us almost a full year to decide what changes, if any are necessary. Thank you to April Russel for organizing this year’s Quilt Challenge. She had 39 beautiful quilts submitted. It was great seeing how people interpreted the theme of ruby red flowers. 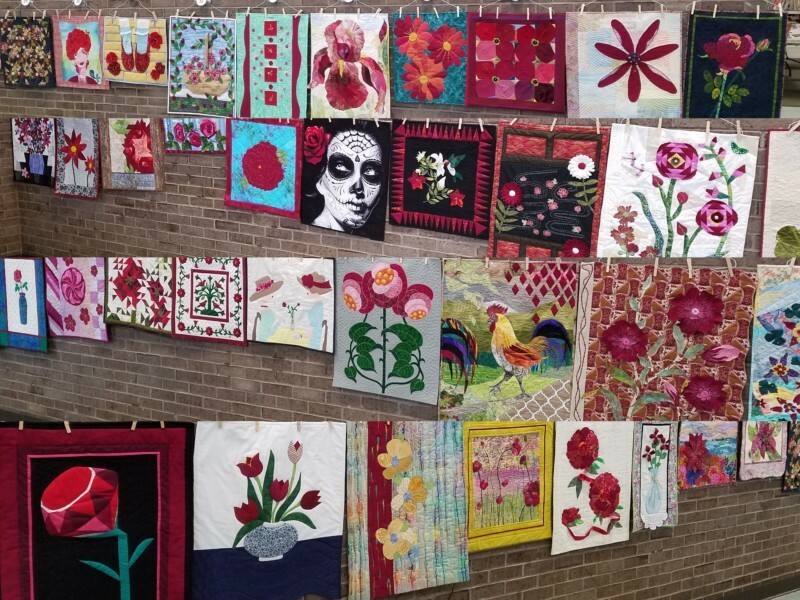 I thought that since it was such a good display of techniques and showed a wide variety of quilting methods, it could be a good display for Arts Westchester to exhibit. This is the organization that gave us the $1,000 grant to support our speaker costs. I have made initial contact with them and hopefully will have more to report at our meeting.